Blue dinnerware is always in demand from modern dinnerware to antique transferware. The blue willow dinnerware pattern is beyond popular and has been produced by many dinnerware manufacturers for centuries. This dinnerware is timeless. It is always in style. Rachael Ray Dinnerware in the Round and Square pattern comes in blue. This blue dinnerware is very unique because it combines the traditional round shape with the modern square shape that is set into the dinnerware. It is made of stoneware with blue glaze on one side and white on the other. I like the shape of plates and the depth of the cereal bowls. It is ideal for casual dining and everyday use. No need to worry, it is micro-wave and dishwasher safe. Noritake Colorwave Blue is very similar to the Rachael Ray pattern, without the square effects of course. It may be your preference if you like white on top instead of the bottom. This blue dinnerware is also made of stoneware and earth tones are used so the white part is actually off-white and it may coordinate better with kitchens that have beige rather than white. The Colorwave line also offers coordinating serving dishes, kitchen accessories and bakeware if like for those to match your dinnerware. If you are into square patterns, you are sure to love the Gibson Soho Lounge Square Dinnerware Set . It is made of stoneware and uses reactive glazes of blue and black. The square dinnerware set is totally modern. It is also microwave and dishwasher safe. 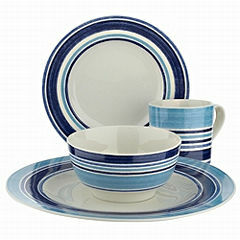 The Sicily Blue Dinnerware Set is very appealing. It is a Thompson Pottery pattern with embossed décor around the edges of the dinnerware pieces. It includes dinner plates, salad/bread plates, cups, and bowls. The bowls can be used for cereal and soup, of course, but they are shaped a lot like a pasta bowl which is a feature that I really like. The Portmeirion Fleur De Lys pattern comes in blue dinnerware and it is very elegant. It is made of a high-quality form of earthenware. It features scalloped edges and embossed Fleur De Lys motif. This dinnerware is microwave and dishwasher safe, so it is designed for everyday use although it is a perfect style to be used in formal table settings. Corelle Livingware Classic Cafe Blue pattern is a wonderful choice for everyday dinnerware. Corelle dinnerware is very durable and fit for a family with youngsters. It is actually glass dinnerware that is thermally bonded to increase its durability. It is break, chip and scratch resistant and the pattern is below the glaze so it is also fade resistant. This dinnerware is microwave and dishwasher safe. The Paula Deen Signature Dinnerware Tatnall Street Bluebell pattern is simply adorable. It is porcelain dinnerware with hand-etched botanical décor. It is very stylish and modern and it is microwave and dishwasher safe. I love the shape of the bowl and it has a floral motif inside of it which is very classy. The pattern is simple, but elegant and the material that the dinnerware is made of is top-notch. The Spode Blue Italian pattern is simply beautiful. This pattern is transferware, which was perfected by Josiah Spode in 1784. This particular pattern was originally introduced in 1816 and has been become a classic. It is made of high-quality glazed earthenware and it is microwave and dishwasher safe. Wanna bring some Southern charm to your table? The Paula Deen Signature Dinnerware Southern Gathering Collection pattern comes is blueberry. It is perfect for a country kitchen. This dinnerware is made of stoneware. It is microwave and dishwasher safe. I like it because the design coordinates nicely with vintage and antique crocks which are 'one of my things'. The Southern Gathering collection also offers serving accessories and bakeware that match the dinnerware for a totally coordinated country kitchen décor. The Blue Willow pattern is a perfect choice is you desire blue and white dinnerware. This pattern is a classic that has been produced by several dinnerware manufacturers in some version. These manufacturers include Spode, Churchill, Johnson Brothers, Home Laughlin, Royal China, Royal Doulton, Staffordshire, and Wedgwood, just to name a few. Blue Willow is the most popular pattern ever produced. It is a prime pattern for collecting. There are still some patterns that are in production presently and there are tons of willow dinnerware patterns in vintage and antique dinnerware. If your intention is collecting, I suggest that you consult a collector's guide to learn more about the pattern, the eras of production and the pricing of certain dinnerware.